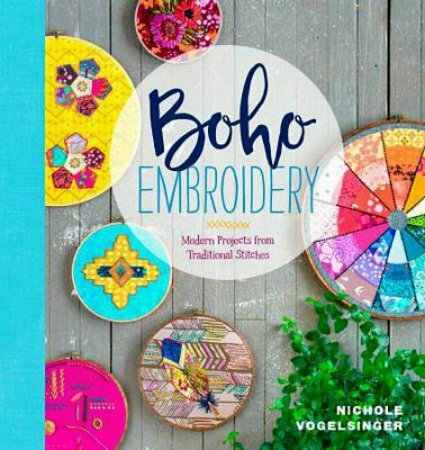 Boho Embroidery is a book that details 20 plus embroidery stitches that work well with hoop art that incorporates applique. It will visually inspire creativity with the goal of creating your own textile art that can be displayed in a hoop, or that can be applied outside the hoop and onto other objects. This book includes instructions for 10 different embroidery stitches and discusses how to use color and neutral shades effectively. The author then gives tips about where to find inspiration, and teaches how to create hoops for effective embroidery. There are 10 different projects ranging from linens to hair clips to buttons -- all projects show practical ways to embellish with embroidery and applique. The book wraps up with suggestions on how to explore your own creativity with pattern suggestions for making your own hoops or accessories.